The Key to the Kingdom is a fantastic journey of mystery, intrigue and innuendos that is sure to capture the heart of everyone who peruses its pages. Once the book is picked up and begun, you will feel the need to complete it. The allure is hard to resist and its fast-paced, extremely informative, imaginative and believable tale is sure to become a favourite with all who are captured within its pages. Grayson Hawkes is a minister whose approach to preaching is contemporary as he uses artistic mediums to relate the tale of the bible to his parishioners, making him a favourite and his church quite popular. A friend, and trusted confidante invites Grayson to meet him at the historic Snow White Cottage owned by James Gamble for a late-night tryst. It is here that the mysteries of Walt Disney World begin to unfold. Handing Grayson a key and the first piece in a perplexing puzzle of clues, the course is set and we are on our way, racing through the streets, concessions and attractions that make up Walt Disney World to unravel the mystery that has been placed before us. You are left breathless as you are lead from one clue to another, wondering who you can trust and who is your enemy. Gathering a group of folks you believe to be those who have your best interests at heart, you step into the web of intrigue and are lead one step closer, through interesting tidbits of Walt Disney history, to the mystery, that is, the key to the kingdom. When I was first approached to review this book, I almost shied away, I am not a huge fan of the Walt Disney corporation as it stands today. I grew up with Walt in my living room in the early 70's, not even realizing, at the time, that he was already gone from us. To me, he was like a grandfather, who kind and wise words made me feel good about myself. I decided to read it anyhow and I am really pleased that I did! 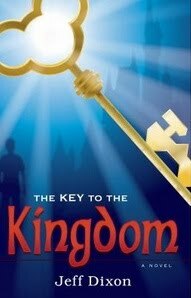 I rarely give a 5 out of 5 rating but The Key to the Kingdom deserves such and I highly recommend to anyone who is a Disney buff (I knew more about Walt Disney than I thought I did, and still, I enjoyed reading it), those who love a good, fast-paced mystery or those who like to solve riddles ( I must admit, this was a real high point for me, it brought out my natural sense of puzzle solving and on numerous occasions, I found myself yelling out my answers to Grayson as the book progressed, LOL). The only thing I regret about this opportunity, is that I didn't opt in for the interview with the author, Jeff Dixon, I would have liked to have picked his brain a little more. I was impressed with his bio which states he researches ancient manuscripts (what I would give to be able to do something such as this) and examines them for content, meaning, understanding and then, using illustrations, he describes his research to listeners at the Covenant Community Church in Central Florida. I hope to be able to read more from Jeff, either with a sequel to The Key to the Kingdom (there may have been a hint at the end of the book alluding to this) or via any other literary projects. This is truly a wonderful book, sure to be enjoyed by folks of all ages! !